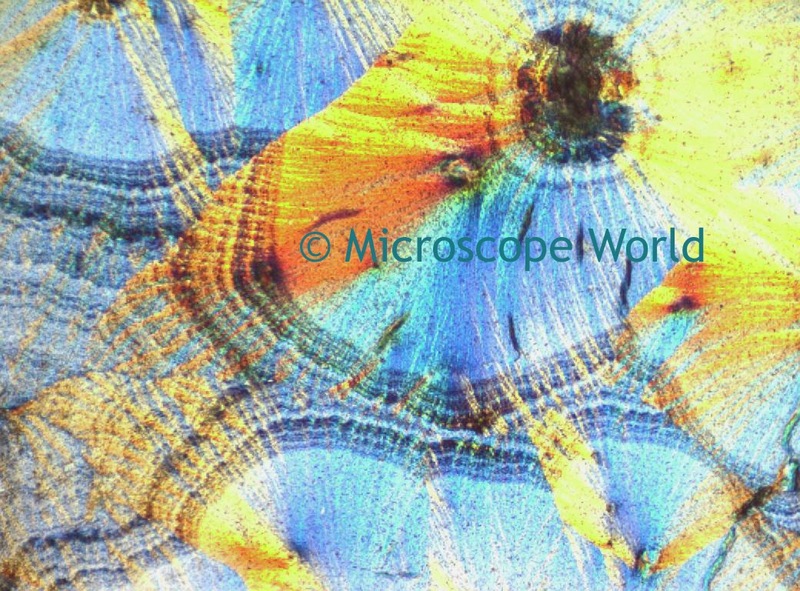 Microscope World Blog: Student Science Project - Blue Water! Your adult for help & safety! Put on the goggles and mash your Vitamin C in a plastic bag, until it is a fine powder. Put all the powder in a glass with 2 ounces (60ml) of warm water. Stir it up. Label the glass LIQUID #1. Put 1 teaspoon (5ml) of LIQUID #1 into a new glass and add 2 oz (60ml) of warm water plus 1 teaspoon (5ml) of iodine. Notice the brown iodine turns clear! Label this glass LIQUID #2. In the third glass, place 2 ounces of warm water, 1 Tablespoon (15ml) hydrogen peroxide and 1/2 teaspoon (2.5ml) of the liquid starch. Label this glass LIQUID #3. Now for the fun! Pour all of LIQUID #2 into LIQUID #3 and then pour the liquid back and forth between the two cups several times to mix them well. Set the cup down on the table. Within a few seconds to several minutes your water should suddenly turn dark blue! You observed a chemical reaction called a clock reaction. It is called a clock reaction because if you try the experiment again, you can actually change the amount of time it takes for the liquid to change colors. The starch is trying to turn the iodine blue, and the Vitamin C is keeping it from turning blue. It is the moment when the Vitamin C loses the battle with the iodine, that the water instantly turns blue. Use different temperatures of water for your experiment and record the time difference for the water to turn blue. What makes the water turn blue faster - really hot or lukewarm water? If you add more or less Vitamin C to LIQUID #1 does the water turn blue faster or slower? Once you have performed the experiment several times, place some liquid starch on a blank glass microscope slide and view it under the microscope. Place some of your blue water on a depression slide with a cover slip and view it under the microscope. How does the blue water look different from LIQUID #1? Record your observations and share them with your class or science teacher. Clean up the liquid by pouring it down the drain and washing all glasses and hands thoroughly. The image below of vitamin C was captured using a polarizing microscope. How does your vitamin C look different when viewing it under a student biological microscope? Vitamin C under a polarizing microscope.